Electrical stimulation produces muscle contractions via electrodes placed on the skin. Our Occupational Therapists and Physiotherapists may use electrical stimulation to stimulate nerve and muscle fibres to help activate very weak muscles or to increase endurance. Using along with Botulinum toxin injections toassist with optimising active range, hand function and spasticity. 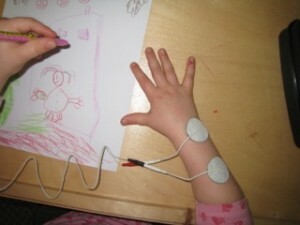 As this therapy is thought to promote neuroplasticity it is recommended as an intensive method of therapy and a specific goal directed program will be tailored by your therapist in conjunction with you and your child in order to identify ways that this therapy can be built into your everyday.